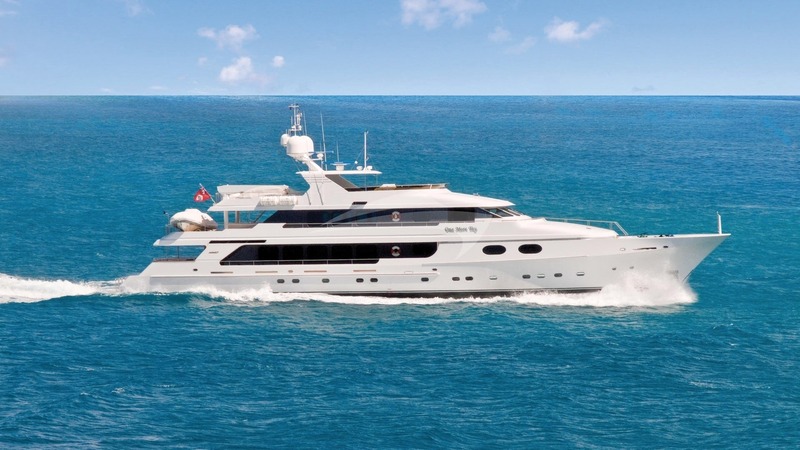 The 155’ Christensen Motor Yacht, One More Toy, available for crewed yacht charter in the Caribbean this winter and the Mediterranean this coming summer has always been known for outstanding cuisine. Recently, at the 2011 Antigua Yacht Charter Show, Northrop and Johnson Yacht Charters was treated to a terrific lunch on board the charter yacht One More Toy, where Chef Eric Sarnow, as usual, created an outstanding meal. A Chef for over 20 years in some of the finest restaurants in both the U.S. and France, Eric has been featured in restaurant guide books, regional publications, as a guest chef on TV on numerous occasions, won several prestigious awards and has contributed some of his own personal recipes to well known cook books. As a charter guest on board the charter yacht One More Toy, you will be pampered on board throughout your charter with the cuisine created by Chef Eric. Our meal started with a poached Caribbean lobster tail, napped with a delicate wine butter and cream sauce, which was light and lovely, while full of rich flavor. The lobster tail was garnished to appear as if there was a small lobster on the plate swimming in a pool of cream sauce. The main course was tender pork medallions sautéed in a Caribbean Jerk sauce, with rich Caribbean flavors, a pleasant reminder of exactly where we were, in the cooling Caribbean breezes, floating on crystal clear blue green waters, on the aft deck of the crewed charter motor yacht One More Toy. To counter the complex spiciness of the Caribbean Jerk sauce was a salsa of fresh local mangos set on top of the pork medallions. Plates were all completely cleaned by the assembled guests. Desert was individual Apple Tart Tatin, with caramelized apples on a delicate crust setting in a caramel brown sugar sauce. To the side was a scoop of homemade coconut ice cream, the perfect compliment. Taste buds were tantalized with a myriad of flavors, however all was light enough for one to feel fully satisfied, without feeling over fed under the hot Caribbean sun, which is a testament to a great Chef and shows a complete understanding of food and the environment in which the food is being served. Lunch on board One More Toy was a taste treat of cuisine that will be sure to please any Charterer that charters One More Toy in either the Caribbean or the Mediterranean for an outstanding charter.